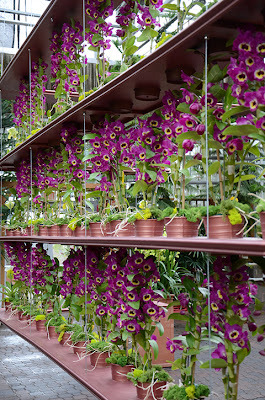 Now that you've seen the Orchid Daze 2012 display as a whole you might like to meet some of the individuals in leading roles--the orchids, of course. 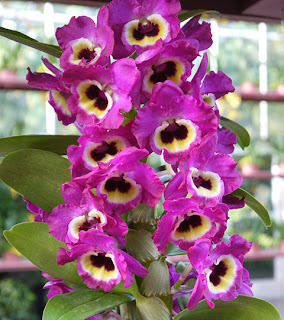 Dendrobium nobile hybrids are among the most rewarding orchid hybrids to grow and display. A well grown Dendrobium nobile hybrid will put any of the ubiquitous Dendrobium phalaenopsis hybrids completely into the shade. The flowers are larger, more colorful, more abundant. They make a gorgeous bouquet-like presentation. And they last a good 8 to 9 weeks in perfect condition before the flowers show any sign of decline. Once you have mastered these you may never want to grow another Den. phal hybrid. Dendrobium nobile hybrids are easy to grow. You just need to know one thing about them, and it's that one thing that sets them apart culturally from their Den. phal cousins. In a word, it's seasonality. In nature the growing conditions that they experience in summer are dramatically different from the conditions that they need in winter in order to set buds. In short: warm moist summers and cool dry very bright winters. These are the conditions you have to mimic in order to grow Dendrobium nobiles well. 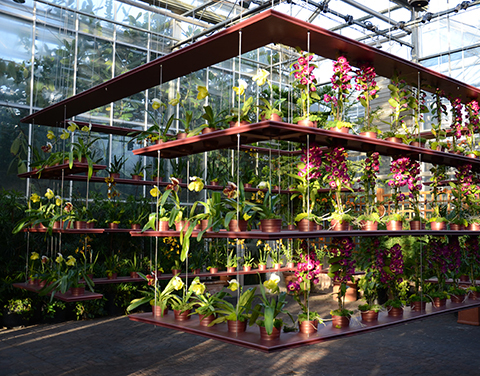 In the summer we grow our Dendrobium nobile orchids in a 50% shade greenhouse at 80% humidity. We fertilize every two weeks with Cal Mag 15-5-15 from April through August and then stop the high nitrate fertilizer in order to harden off the new canes, which are staked for support. At Thanksgiving we move the nobiles (and the Dens in section Callista) into a nearly full sun greenhouse that drops to 53º at night, watering about every two weeks. This year, admittedly, a freaky warm year when all growth has been accelerated, they flowered in March. The renowned growers and breeders of Dendrobium nobile hybrids at Yamamoto Dendrobiums have produced a terrific cheat sheet for growers. Don't forget to check out their gallery, which ought to get your pulse going!